The Chromeboy. 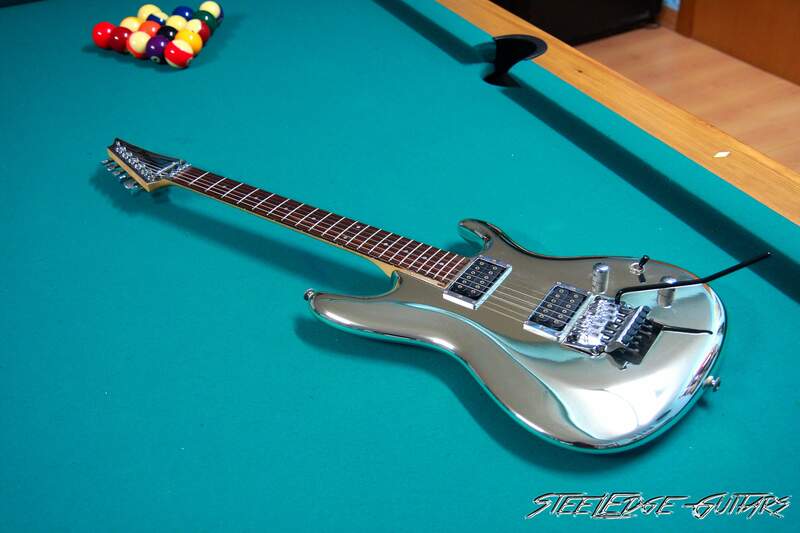 Ibanez Joe Satriani JS10th Signature. My personal Holy Grail! 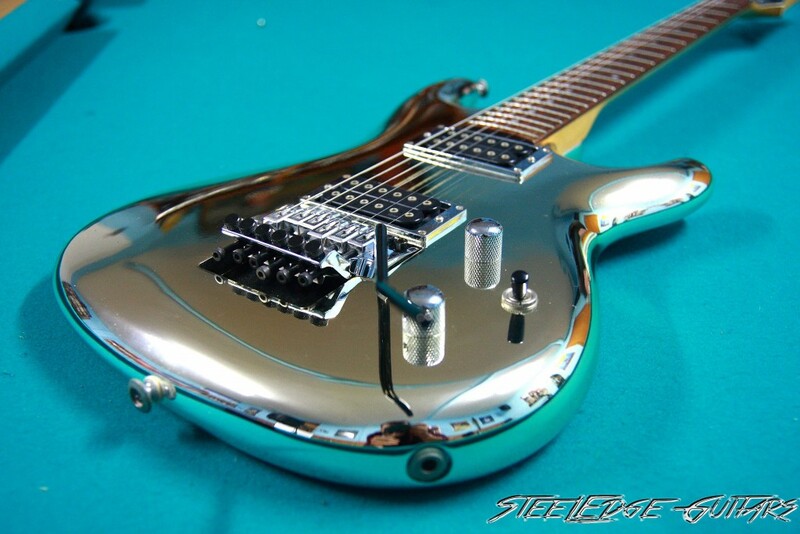 And probably one of the most appreciated guitars for any Satriani fan. This guitar represents my dream come true, my most wanted guitar EVER, the guitar I dreamed of since I was a kid and my most cherished jewel. 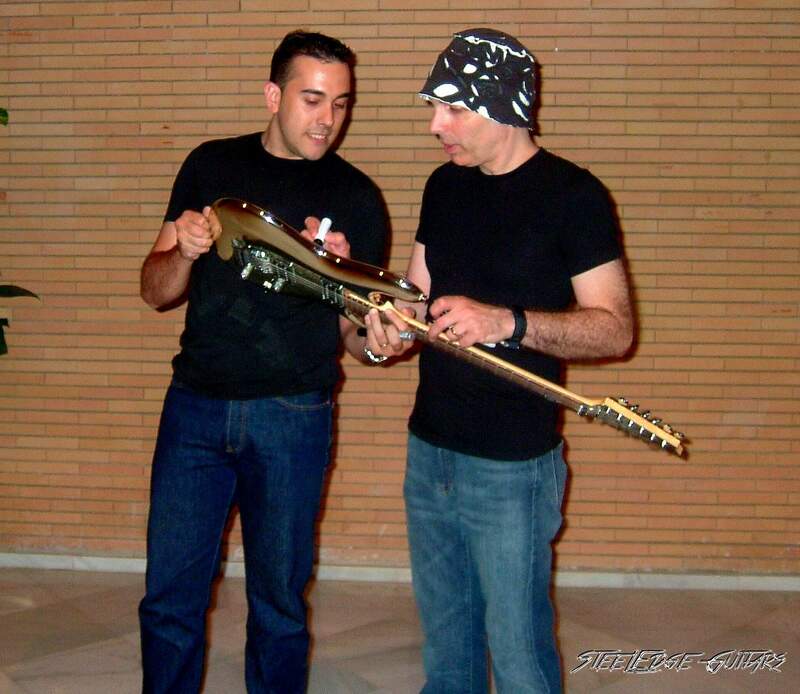 And more than that, an unbelievable story of how I manage this guitar to be signed and played by Joe Satriani himself in a meeting with my all-time-guitar-hero. Limited model released in 1998 for the 10th Anniversary of the collaboration between Joe Satriani and Ibanez guitars, 507 pieces known, so no very limited but still rare, and rarer to see in very good condition, as the finish is somewhat fragile and there´s a lot of examples of the Chrome peeling off the Luthite body. This is number #154, is in almost MINT condition, 9/10, some micro scratches in the clear coat that can be seen at right light, little spots that are common in this model, and some wear on some hardware parts, I´ve played her gently (and so did Joe!) 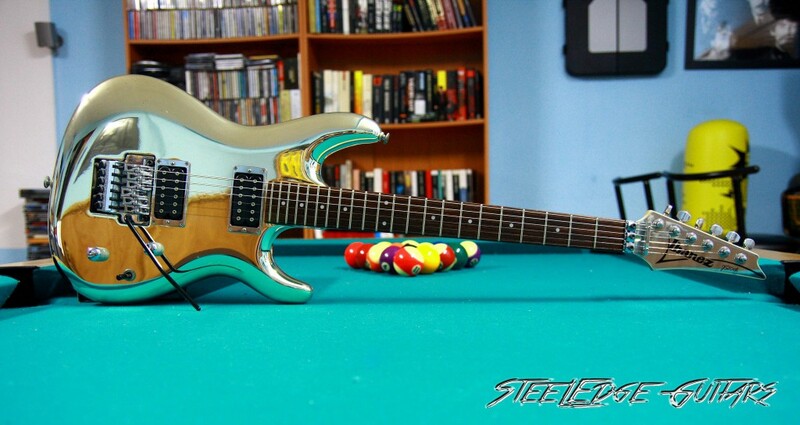 so is not 100% mint but I don´t really mind, as I never intend to sell this guitar. Yes, I said that. NEVER! About the finish…what can I say….is a reference in guitar finishes, people can only open their mouth and drooling…… is a guitar that everybody looks and point at. The guitar, as a collectible model, comes with a very beautiful silver hardshell case, red plush interior, with a plaque commemorating the 10th Anniversary of the collaboration between Joe Satriani and Ibanez guitars, and also comes with a silver DiMarzio Strap and a Silver Jack Cable also from DiMarzio. So exclusive, so beautiful….when you open the case, the JS10th looks like a jewel, shinny in its reddish plush case. The sound of this guitar is just unbelievable…vey particular, as the body is not wood, but Luthite, a special plastic material, which gives the guitar very unique tonality. 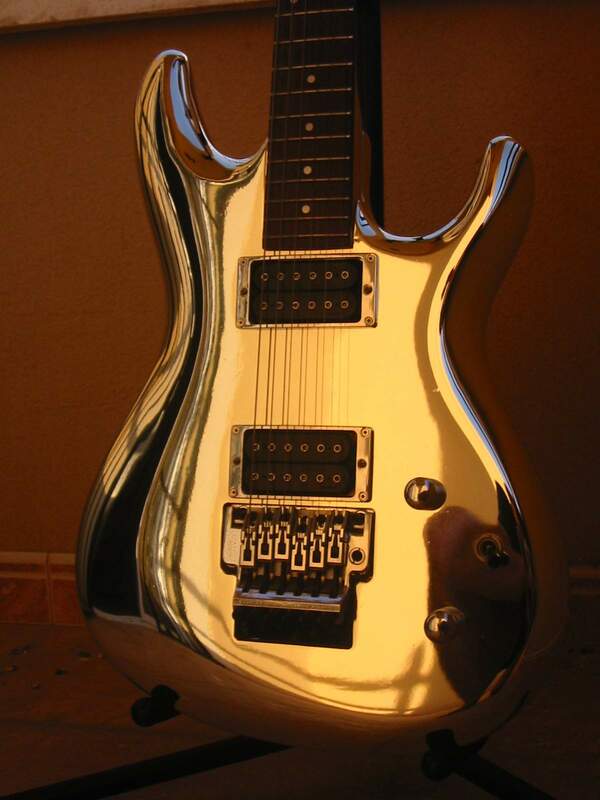 Is my favourite guitar when talking about harmonics, Satriani feeling and dynamics. 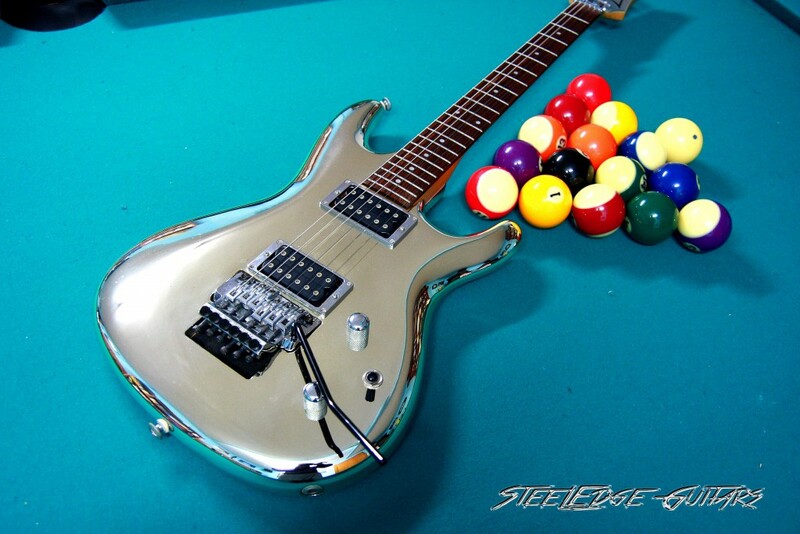 Is a very “hard rock” guitar, with also very beautiful bluesy tones and an amazing clean, one of the bests ever for me. Really beautiful and 100% Satriani clean that you hear in Always With Me.., Baroque, Circles, Midnight….and with the different pickups combinations you can get from Strat classic sounds, to Tele twang, from Les Paul fat sound to aggressive Charvel/Jackson punch. With a little overdrive, the sound is SO dynamic, very rounded, almost 3D sound like I usually say 😉 If you push a little harder and put some good distortion, there you go! : Satch Boogie, Surfing With The Alien, Summer Song…is all there, all the Satriani vibe. Is amazing how natural and organic this guitar sounds even being the body made of Luthite, not wood.Very special tonal quality that fits perfectly in Joe´s sound. The guitar is very comfortable to play, the neck is Strat-like, but with compound radius, very very low action and very smooth feeling, in the neck and also the fretboard, where the quality of the rosewood makes your hand fly over it. 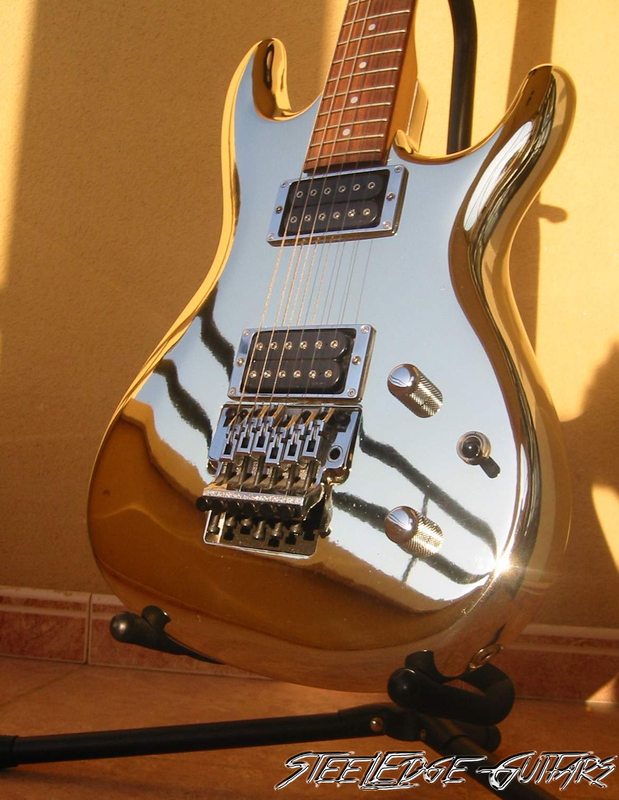 One of the best Ibanez´s I´ve ever tried, with a very unique tone….maybe there is some of “fanboyism” in this review, but I can´t help it, I love this guitar, is my all time favourite and the best in the quality + look + sound + playability + desirability equation. 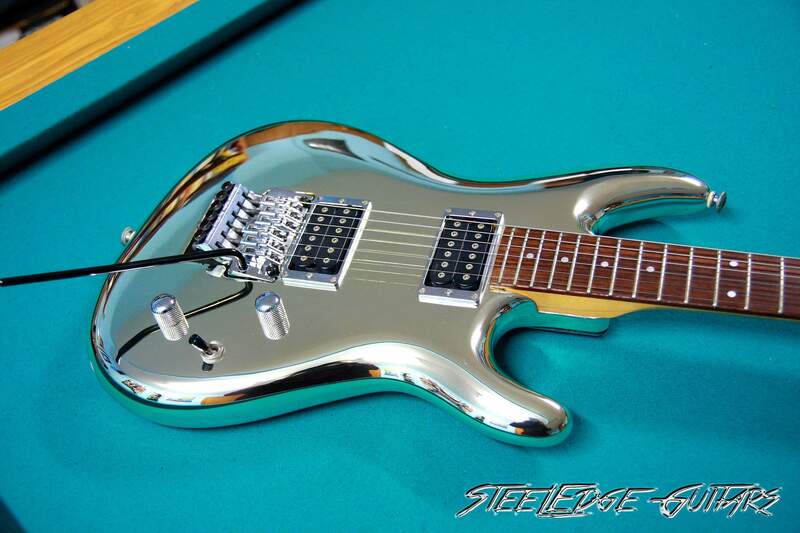 This guitar, apart from the JS2 which was never comercialized, and the JS2PRM, is the one and only Chromeboy.The Js2PRM is a little more “dark chrome” finish, so, for me, the Js10th is the real Chromeboy. 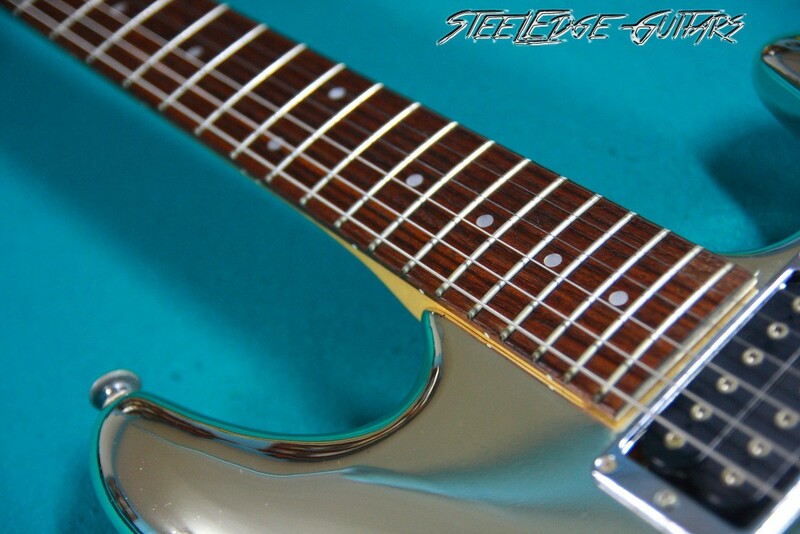 People claim that is a very fragile guitar…and it is, but don´t overreact…you can play her gently and don´t have any problem ,but if you hit it hard, the finish will suffer more damage than a regular guitar, as the chrome seems to peel off the luthite body. I’ve even played it at some gigs carefully and never had a problem, just have to be a little more careful than with other finishes. I had another Chromeboy Js10th before this one, number #26, but was totally ruined of hard playing, dings, need re-fret, etc, but when I saw this one, totally mint, I couldn´t help it and grabbed it fast for myself, selling the other one at a ridiculous price.I found it just out of casuality, after chasing another one in the US.I found this one in Germany, which was great because you don´t see a lot of these here in Europe, the seller was very kind and we made a fast deal. I paid pretty good money for it at that time, but was worth every cent. 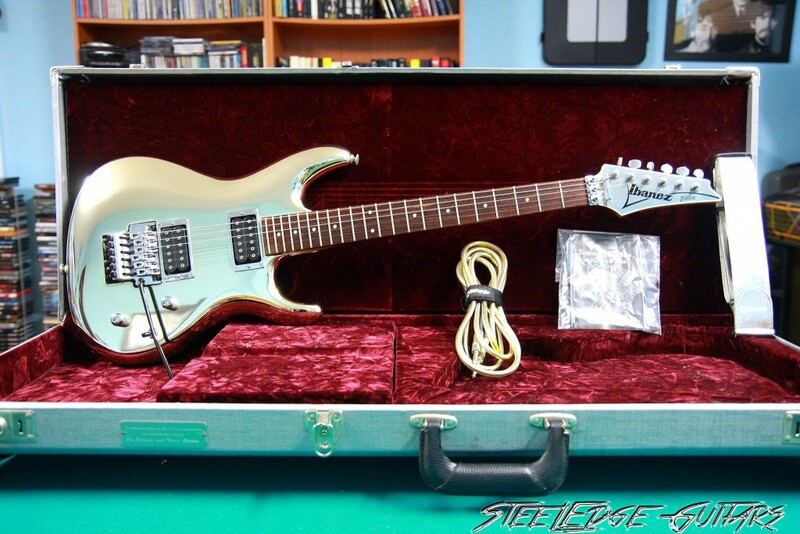 Now, is worth a lot more.When I got it for the first time, I knew I finally had made my dream come true…a totally MINT Js10th with all the case candy. 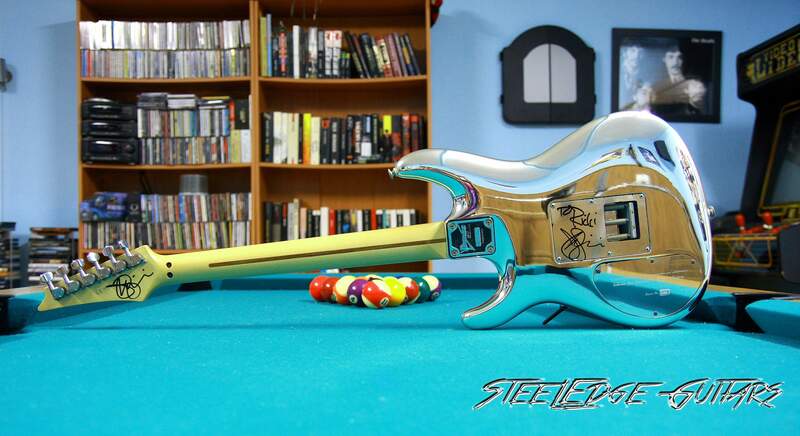 As a collector, is important to get the guitar with all the case candy that the guitar originally came with, specially in so cool limited models like this with the Silver Strap, the Silver Jack and the cool Silver Hardshell Case. 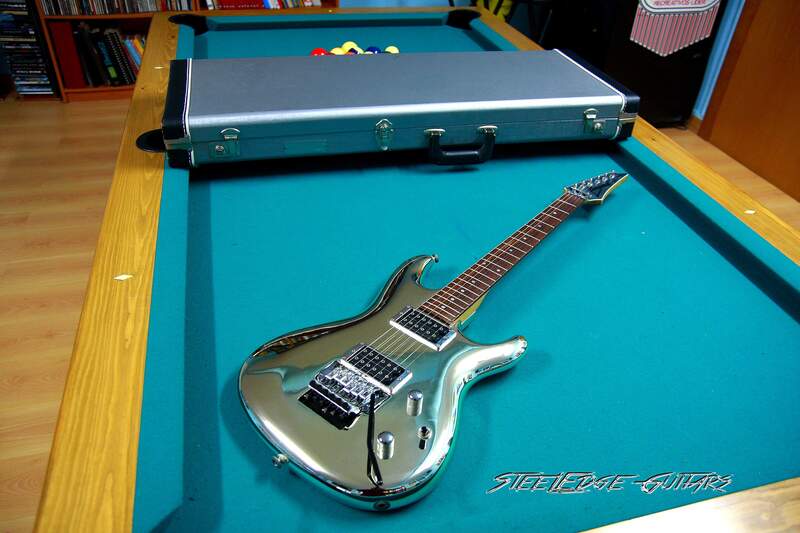 I know there are more expensive or more exclusive guitars out there, but this is the one I always wanted to own, the one in the pics that used to cover all my high school books, my most wanted guitar EVER, the guitar I dreamed of since I was a kid and my most cherished jewel. I´d never sell this one. NEVER. 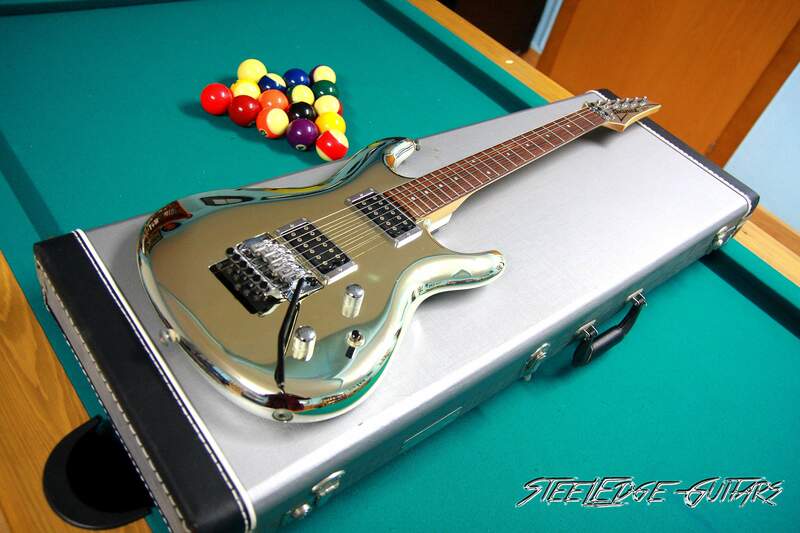 Would be the only guitar I´d keep in case of having to choose just one from my collection. I love to look at her, clean her, and of course rock with her. I enjoy every note I play out of her. Is a treasure to me, maybe the most beloved material possession I have. I smile every time I just look at her…. This guitar is more than an “object” to me, and that´s why I would never part with her, there are things that money can´t replace. This guitar always remind me of my teenager years, and the inspiration that Joe´s music and playing has had in my life, for me this is more than “just a guitar”, is something that links me to my inner feelings about music and guitar playing. 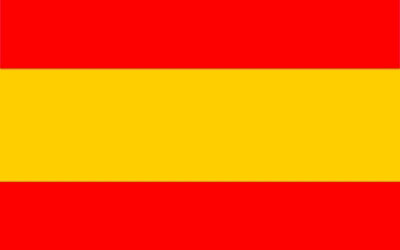 I live in Almería, a very small city where barely or none big rock bands come to play, is very unusual to have any music “personality” here, so the odds of Joe coming to play to my city were minimal….but it happened!!! 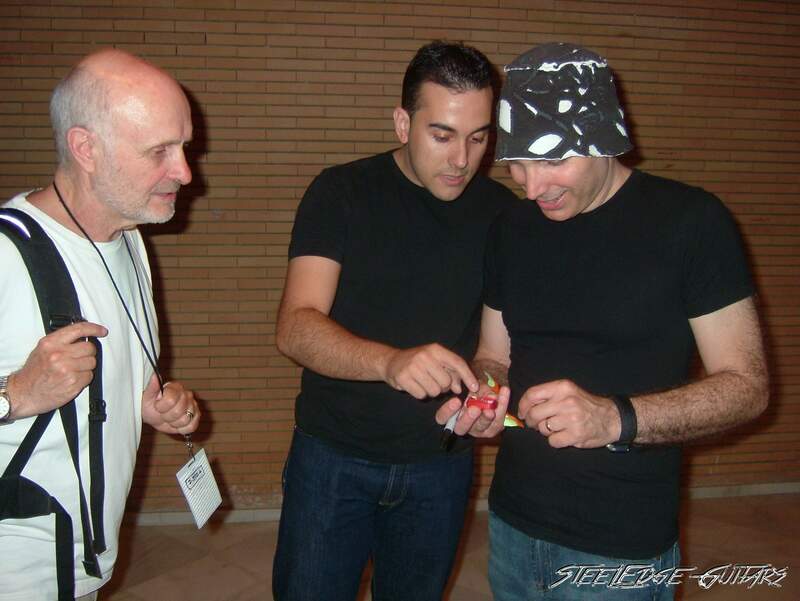 In 2006, during the Super Colossal Tour, Joe came to play to Almería, and that was another dream I could make true, go see Satch playing live in a small auditorium. Of course, I got first row tickets as soon as I could, but, after that, I moved some connections I had and got 4 backstage passes for me, my wife, my sister and my best friend. I inmediately thought about taking my Chromeboy to Joe and have her signed by him, so I took my Chromeboy to the gig in the auditorium. A friend of mine who works there kept the Chromeboy for me in a private room and gave her to me after the gig was finished. The gig was just AMAZING, I had Joe playing like 5 meters from me.WOW!!!! I just couldn´t believe it!!! I shot a lot of pics with my camera en enjoyed every second of the show, Joe was just amazing, I saw him playing all his classic songs just some meters away from me, I could clearly see with detail his technics and playing, and was just unbelievable! 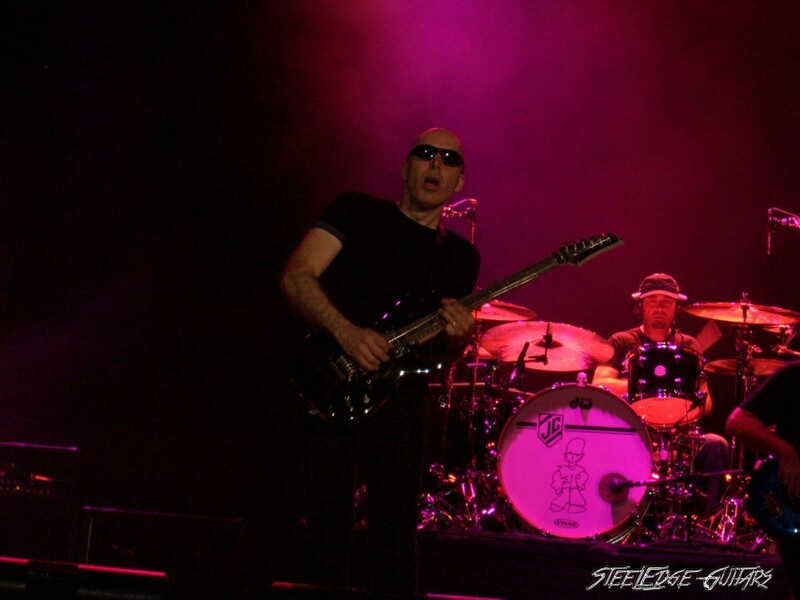 After watching Joe in my old VHS Satch Tapes and in the newer DVD´s, this was just like unreal, it was like living inside of one of those DVD´s, experiencing Joe´s music and playing live is an experience every Satch fan should have. After the show, we waited some minutes until Joe showed up, and then we were introduced to Joe by his manager, Mick Bridgen, a very nice man who treated us all fantastic. And then , I met the man himself. My idol. All I can say is that Joe is the nicest down to earth man you can imagine. I spoke with him telling how much I loved his work and how much meaning his music have had in my life. He asked us if we liked the concert and thanked us for coming, he was very nice, I introduced him my wife (who was my fiancée in that moment) and Joe asked us when we were getting married (which was 2 months later) and congratulated us about the wedding. We talked a little about the city, and how was the tour, about guitars…really don´t remember that well because I was like in a cloud…. Then I showed him my Chromeboy and asked him to sign her. He took the guitar and I remember that he asked if I wanted just to sign or a dedication to me personally. Of course I said “A dedication!! !” and he told me that some people want him to sign the guitars or stuff with no personal dedication because then the items were more valuable to sell on eBay, etc. 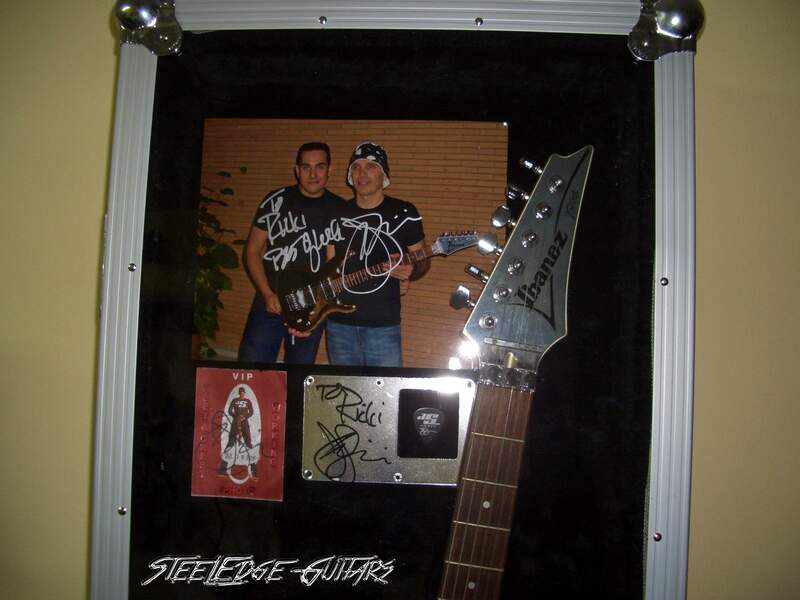 I told him I´d never sell that guitar and that would be a real honour to have it dedicated by him.He carefully took the guitar and dedicated it to me “To Ricki” in the backplate and also signed the back of the headstock. So…. 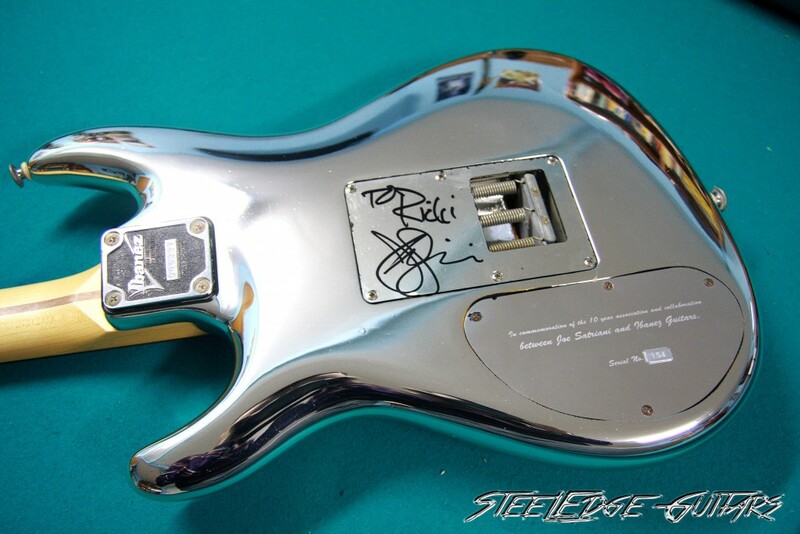 I got the Chromeboy dedicated to me in the back plate and also signed the back of the headstock. I couldn´t be happier, my most beloved guitar played and signed by the Master himself to me!!! 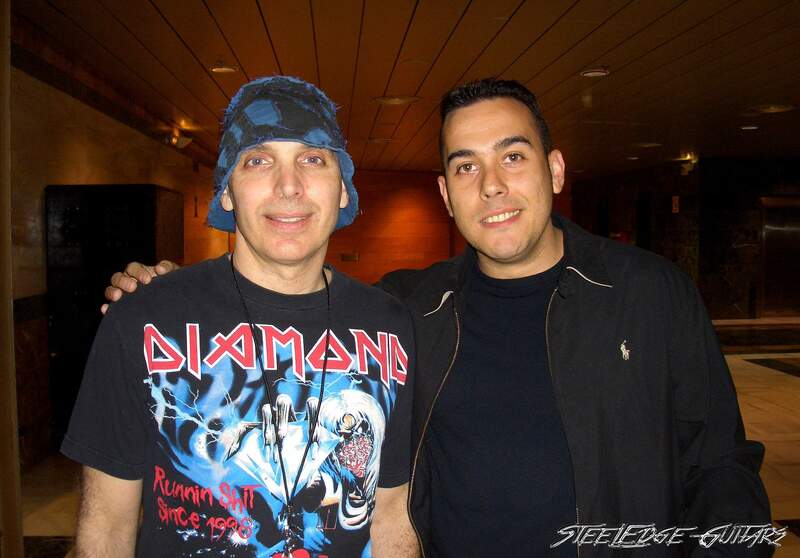 !He also signed all my Satriani records I had taken with me and some other stuff.I introduced my wife (we were getting married in two months from that day), he talked briefly with her, with my sister and my “old brother”, a very very close friend, who had came with us to the gig. After that I gave him a little present, a silver INDALO, symbol of my city, and he was totally flattered, he told me I didn´t have to, but I was really happy to make a little gift to my idol, also, we joked with Mike about how did the symbol looked like a pre-historic silver surfer 😀 He then took a pic from his pocket and gave it to me, told me that was the last pic he used in the gig, and I keep that pic as a TREASURE along with my Js10th. So, we said goodbye and I promised him I´ll go to see him again next time he ever come to Spain. He told me he would love that, and told me to contact Mike or his crew for backstage passes (that was before all the “Meet and Greet” tickets stuff). I was like Flyin´in a Blue Dream 😉 Got to know my idol, had my Chromeboy dedicated to me, hang around with him for a while, gave him a gift, got his used pic….I couldn´t even dreamed of that! I´ll keep that memories with me forever, I was so happy of knowing Joe and actually experience in first person how warm he was, I´ve always loved Joe for his music and his playing, but after I got to meet him, he was even more of an idol to me. I know that Joe meets hundreds of fans daily, so when he remembered about us and asked about the wedding and all the stuff…man…I felt kinda special, really touched me. I can´t imagine a better experience of meeting someone you really idolize. You can´t be such a great artist if you don´t have that “human quality” inside of you, a lot of what Joe communicates with his music is part of his soul, a very beautiful soul to me. And about my Chromeboy…. 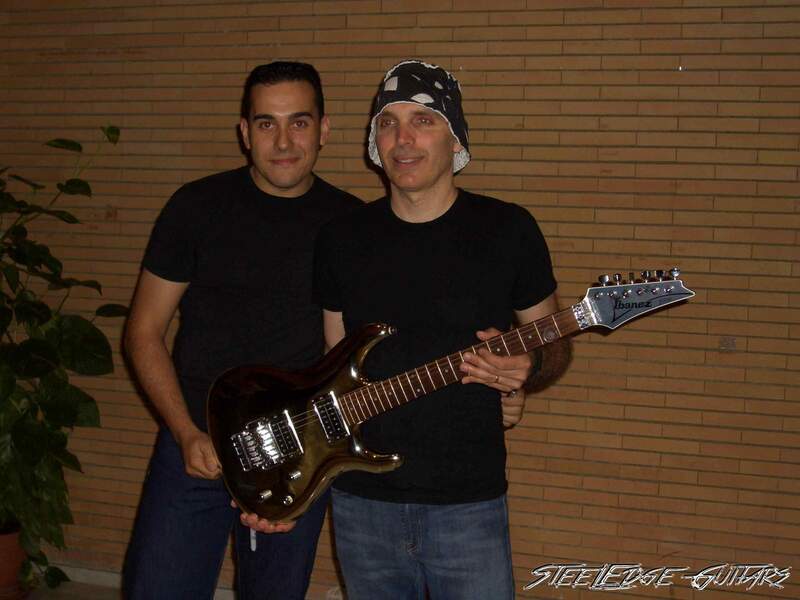 this guitar represents my dreams, my love to music and guitar, and one of the best moments in my life, meet my idol, Joe Satriani, so I´d say is the most beloved guitar in my collection and never, never will sell her unless I´d be forced to for reasons I can´t and don´t want even to imagine. The inspiration that this guitar brings to me, the good vibe, the good memories about my meeting with Joe, all my teenager years coming back to my head, when I always dreamed about owning this guitar….as I said is something I just can´t describe with words, this guitar is part of my life, and I hope someday it will be part of my son´s life too.